This particular Mad Magazine origi nal art i s the 3rd page of the 4 page story called "The Joe Nasty Show". The original art is from Mad. Pencils and inks by Jack Davis. It measures 17.75" x 24.5". Take a look at this and my other original art for sale. We try to describe all items as accurately as possible. The item "Mad Magazine #116 pg. 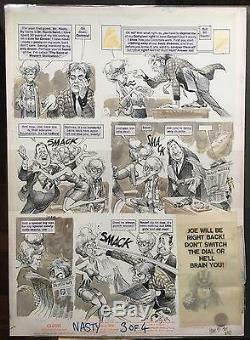 3 of 4, Jan'68 original art Jack Davis. Interior page Sale" is in sale since Saturday, June 10, 2017. This item is in the category "Collectibles\Comics\Original Comic Art\Interior Pages". The seller is "ftlom" and is located in Calgary, Alberta. This item can be shipped worldwide.